Tempered glass is made from normal annealed glass via a thermal tempering process in which the glass is heated to near about melting point, 750C and air quenched at a particular pressure. The sudden temperature difference puts the glass into a stage of compression with the centre core in tension. 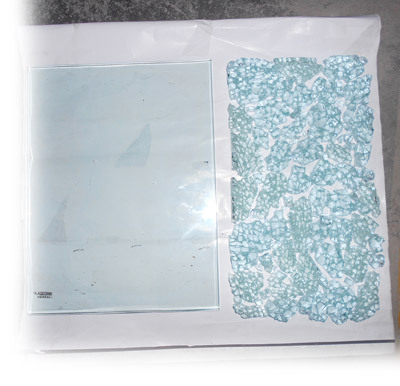 Tempered glass gains its added strength from these compressed surfaces. The molecule concentration towards the centre increases thereby increasing the impact strength by 5 times. A fully tempered glass is 4 to 5 times stronger than an annealed glass of similar thickness. Beyond a certain impact the glass disintegrates into small blunt pieces which greatly reduce the chances of injuries. The number of fragments per square inch is specified in the standards. Greater the number better the toughening. 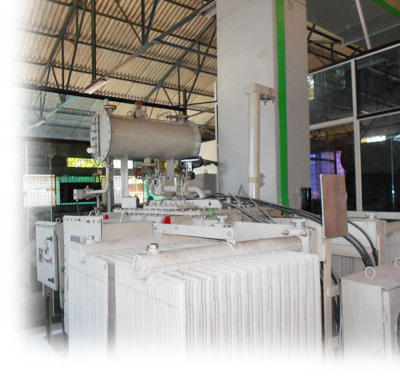 Normally the process of toughening induces a certain amount of surface distortion in the glass. Today�s technology provides for radiation and convection heating in the furnace. This provides homogenous heating and reduces the surface undulation viewed by the human eye. Due to the internal stresses toughened glass cannot be cut to size after the toughening process, hence all glass fabrication like cutting, drilling, and slot cutting, etching polishing and edge preparation should be performed before the tempering process. The clarity, physical properties like heat transmission, solar radiant heat properties etc. 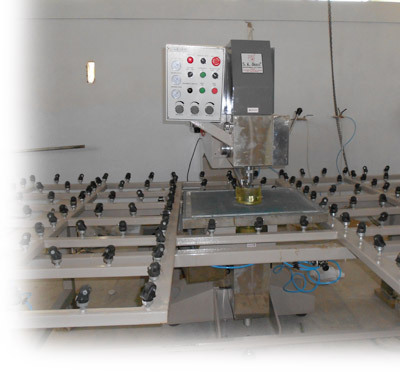 of the annealed glass is not altered while tempering. 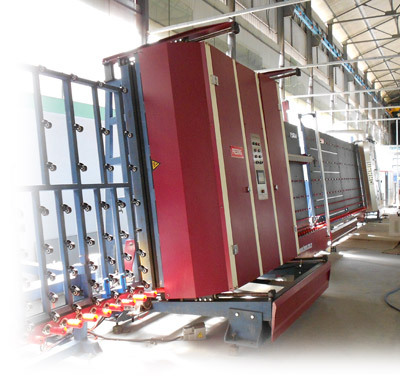 The process adopted is the same with the only difference being the cooling time for heat strengthened glass is more than that of toughened glass. Both these glasses are normally very difficult to break and once they break the toughened glass breaks into small fragments which will not cause any serious injury. Toughened glass is best suited for shop fronts, furniture tops, shower cubicles, spider glazing, partitions, door etc. Heat strengthened glass when broken, breaks into linear fragments. Heat strengthened glass is best suited for structural glazing, planar glazing etc. Heat strengthened glass when used in high rise buildings will not cause any injury to the inhabitants. This feature of tempered glass has made it favorite to the architects to consider extensive usage of glass is building industry. The intense heat (over 750 degrees Celsius) used to harden the glass creates a dense outer envelope as it cools, which creates improved insulating properties. Three-quarter-inch thick tempered glass can withstand the impact of a half-pound iron ball dropped from a height of 36 feet, but a comparable piece of plate glass will generally break if the weight is dropped from a height of 3 feet. A 12mm thick square tempered glass of side 1m placed on a steel frame can withstand the impact of a 900gm iron ball dropped from a height of 3m, but a comparable piece of plate glass will generally break if the weight is dropped from a height of. Tempering makes glass that can withstand thousands more pounds per square inch than plate glass, making it a favorite material for tabletops and other weight-bearing surfaces. Because of its density, tempered glass is generally less clear or transparent than comparable plate glass and is often colored or coated with reflective materials, which also protects its surface. Tempered glass crumbles rather than shattering, which is a preferable trait for uses that may be subject to sudden forces, like car windshields. Toughened glass has a few drawbacks. 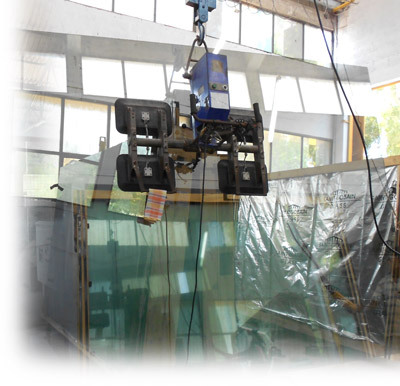 Once toughened, the glass cannot be cut, drilled, beveled, and deep-etched or acid treated. Therefore, all design decisions have to be taken before the glass is processed. Secondly, tempered glass is prone to spontaneous breakage due to the presence of nickel sulfide, which cannot be completely eliminated during processing. Third, as it is a heat-treated glass, it can have bows, warps and process roll distortion on the surface and this may interfere with the optics. Spacer: This provides for the requisite space in between glass panes. 8,10,12,15 mm spacer is available. Desiccant: These are molecular sieves deposited in the spacer frame to absorb water vapor entrapped in between glass panes to maintain absolute transparency. Primary Sealant: Bonds two glass panes absolutely. Poly iso butyl is normally used. Secondary Sealant: Avoids permeability of external atmospheric air in to the IGU. Silicone sealant is used. Plain glass as one side and reflective glass/ low emissivity glass on other side. Plain glass on both sides. Tempered / Heat strengthened glass for outer side and Annealed glass for inside. Tinted glass on outer side and plain glass for inside. These combinations can be chosen depending upon individual requirement. The average reduction in noise levels when using IGU will be 45 decibels, heat reduction ranging between 70 to 80% depending upon the performance of the outer lite and savings on air-conditioning cost will be around 30%. The desiccant granules placed in the aluminium spacer frame (hollow) absorbs the moisture in between the glass panes to make it absolutely clear. Two layers of toughened glass separated by an air space. Ideally both lites can be of 6mm thick or higher thickness depending upon the size of the glass pane and the wind speed in the area of application. The air space is provided by a porous aluminium spacer in natural anodized or color anodized finish. The size of this spacer can be 8 *6.5mm, 10*6.5mm, 12*6.5mm, 15*6.5mm. The inside of the spacer frame is filled with desiccant molecular sieves which absorbs water vapour entrapped between the glass lites. The corners of the spacers are keyed with UPVC corner keys. The primary bonding of the spacer and the glass lites is with poly iso butyl sealant (primary sealant). The secondary sealing is done with silicone sealant and this prevents permeability of external air/water vapour into the double glazed unit. Reduction of UV rays entering into building. Laminated glass is a sandwich made of one interlayer of plastic Poly Vinyl Butyral between two or more glass layers. Generally PVB thickness ranges from 0.38, 0.76, 1.14 & 1.52 mm. PVB keeps the layers of glass bonded even when broken, and its high strength prevents the glass from breaking up into large sharp pieces. The plastic interlayer also provides protection from ultraviolet rays and attenuates vibration, which gives laminated glass good acoustical characteristics. As laminated glass has good energy absorption characteristics, it is also a critical component of protective glazing, such as blast and bullet-resistant glazing assemblies. Laminated glass produces a characteristic "spider web" cracking pattern when the impact is not enough to completely pierce the glass. Laminated glass is normally used when there is a possibility of human impact or where the glass could fall if shattered. Skylight glazing and automobile windshields typically use laminated glass. In geographical areas requiring hurricane-resistant construction, laminated glass is often used in exterior storefronts, curtain walls and windows. Two layers of toughened glass bonded by a lamination to create a shatter proof material that can be laid horizontally either at the floor level or above the head. The shatter proof characteristics provide adequate safety to human inhabitants. Glass & Glazing provides a UV stabilized resin lamination which is more environmentally sustainable and also provides a sound reduction of 35 decibels. Ceramic frit coatings are often applied to glass to improve its aesthetic appearance or to help reduce glare and reduce solar transmission. These coatings also serve to diffuse the light as it enters the building, providing for a more uniform distribution. The ceramic material is silk-screened onto the glass and is then heat fired to create a permanent coating. Frit patterns can range from a simple dot pattern to a one of a kind custom pattern. Frits are also available in a wide range of colors.